This is a table top version of our original Marble Chase game but played on a larger board with larger marbles. This is a double-sided board. Side 1 is a 4 person game and side 2 allows up to 6 people to play. Some people play with dice and others play with a deck of cards. The choice is yours. Race your marbles around the board and try to get to your home position before your opponents can get to their home. There are hazards along the way.....like your opponents. They can send you back to start if they land on you! Order today and start having fun! Let us know what you call the game. 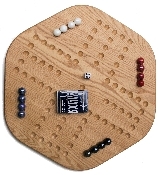 The game board is made from Oak and finished with a furniture quality finish. Includes six sets of four marbles (24 total), 1 dice (or cards) and comes with playing instructions.